Going Deep – Preview Event Primer! DWD is seriously spoiling us with spoiler season. In addition to neat new mechanics, and enticing new build-arounds, we also get a Preview Event! 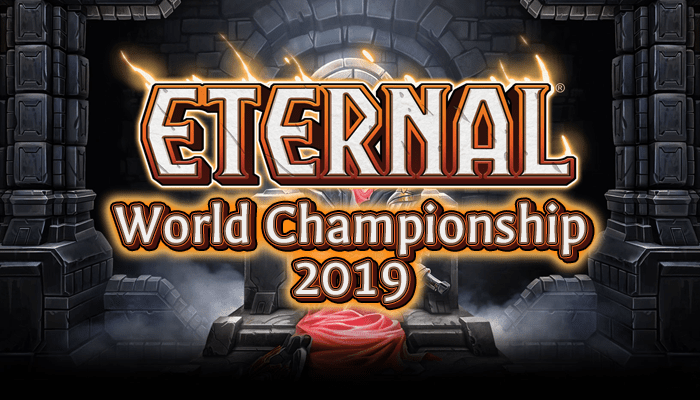 Since my last article was focused on the RNG Eternal preview I didn’t get a chance to talk about the event that happened last weekend. For anyone who missed it… what are you doing with your life? It was a total blast, and had outrageous payouts! Now we get another event right on the heels of the first one, and I would argue that this one is even more awesome! For anyone who hasn’t read the announcement, we are basically playing in an environment of “Set 2 factions only”. You must play with a 75 card Xenan, Praxis, Skycrag, Hooru or Argenport deck, and you actually get 4 copies of the corresponding preview card shuffled in at the start of your matchs. I personally find this extremely fascinating as an exercise, since we get to play in a whole new sandbox. How does the meta look when there is no Rakano? No Shimmpack? No Combrei? No Feln Control? No idea! As soon as I saw this I got very excited, started cooking up decks, and thinking through the format. I have serious gold built up solely for the purpose of Omens of the Past, and nothing scheduled this weekend. Let’s just say you’ll be able to find me in the Event queues. Even though I plan to beat each and every one of you to death for those sweet Omens packs, I will share with you my initial impressions of the format. First I will share some bigger picture reflections on the format, and then run through 10 decklists that can provide a starting point. Let’s get started and talk about some of the biggest winners and losers! This weekend’s event is going to have an entirely different metagame than the ladder just as a function of most top decks being illegal to play. So what does that mean in terms of the value of various cards? Sure Xenan Killers is a viable archetype on ladder, but should we change anything for the Event meta? Are there some strategies that get pushed out by decks like Armory or Rakano? I think the answer is yes, and I actually expect a very diverse environment despite the relatively strict boundaries. With that said, we can point to a few cards that have gone up or down in value based on what we know about the format. Let’s get started with the winners! Soulfire Drake is an excellent card that is held down by its arch nemesis Desert Marshall. So what happens when the natural predator becomes extinct? There is also a side benefit of losing Maiden as form of void-hate. We need to see where exactly these line up with the rest of the format, but there is an opening for them to do a lot of work. There are exactly 4 units in the game that keep Permafrost from being absolutely oppressive. Those are Sandstorm Titan, Champion of Glory, Icaria the Liberator, and Desert Marshall. How many of those are legal in this format? One of the most obvious strategies that people have been discussing is Praxis tokens. This is a deck that enjoyed some success on the ladder on an intermittent basis, and Champion of Impulse is certainly not embarrassing to play in that style of deck. There are also some Skycrag variants that might be looking to play a go-wide strategy (Assembly Line is a spell for example). Cheap sweepers will dump on all that garbage. Silverwing Familiar is one of the most meta-dependant cards in the game. If you are in a metagame that is moderately aggressive, and is essentially “fair”, Familiar becomes the scariest 1/1 you have ever seen. The second there are relic weapons around Silverwing becomes a massive liability. With Armory (and Desert Marshall) out of the picture I think Familiar has the potential to be outrageously powerful. While it is true that every deck must include multifaction cards, it is also true that every deck cannot play many multifaction cards. The absolute maximum you can have in your deck is 8. If you are not playing 4x Annihilate in your Shadow decks I expect you are doing it wrong. There are many other cards that gain from this change to the meta, but I could not fit all of them into the list. What about the losers? Don’t get this one twisted – Harsh Rule is still one of the most powerful cards in the format. The bigger issue is just having a less comfortable home. Argenport Control might be a thing, but I am not enthusiastic about it for now. Hooru control is very real I am sure, but Harsh Rule is generally best in a deck that can leverage the power of a 3 faction deck. Although Hooru Control decks have used Throne Warden in the past, he really shines in Armory, a deck that is totally unplayable in the format. In addition, you have got to expect a good number of beefy Time decks given that both Xenan and Praxis midrange look reasonably well positioned. Although he is playable, he is much worse than he is on ladder. It is pretty much as simple as this – in a world where Annihilate is good Deathstrike is just second tier. In addition, one of the two decks that can play Deathstrike also has access to Vanquish, which is usually just better. People have done an amazing job cutting the clunky removal spell from their decks, and I expect that will be exaggerated for this event. As you will see in a couple places in this article, I really feel like tokens is a trap. It is really easy to counter if you want to, and the “level 0” approach to the format makes tokens seem very obvious. Smart players will be teching cards like Storm, Stray into Shadow, and Alpine Tracker into their decks, looking to farm the Assembly Line players. Although the card still might be strong enough to break through, lets just say I am skeptical. You know what gets dumped on by both cheap sweepers and tokens? 2/1s. There are also no good weapons for him to use to help out. Any Titan match up also seems heinous without the help of Annihilate or Vanquish. There are just oodles of problems for our little onion, and although there might be an aggro deck out there looking for a 1 – drop, I am just really sceptical that this is the best place to be. I have written up 10 decklists that I believe are a reasonable starting place for the format. I basically built one deck one aggressive and one defensive deck for each of the possible faction pairings. I am writing these before actually being able to play in the event, so I am tuning them to a theoretical meta game, as opposed to the actual meta game from the event. I also don’t quite know how it will feel to play the 79 card versions, since the extra non-power cards will distort the power ratios. For each of these decks I have played some version of them in the past (except for one, which I will comment on) so I can promise they are at least functional. I have also written some theoretical match ups expectations, but I could be totally wrong on some of these. I also offer some potential changes to make to the deck if you want to adjust your tact. Not knowing how the format plays out there is no way to know if these particular builds are best, so I wanted to offer some interesting variants for the purpose of adjusting your deck. I know a lot of netdeckers out there just want a quick-and-easy answer to the format, but I really would encourage you to be creative and responsive, because this is an event that will really reward innovative and dynamic deckbuilding. You have seen this deck before. Basically the classic Praxis tokens style deck. I don’t think there are many changes you would want to make from whatever version of the deck you were play 2 months ago. I will warn you that this deck has a big target on its head, so you shouldn’t expect to surprise anyone with this kind of list. Champion of Impulse is kinda just a dude (or dudette I suppose) in this list. Sure you can utilize the bonus power sometime, but your curve is relatively low. Possible Changes: This deck could go up or down the curve very easily. You could play more 1-drops and go super aggro, or you could move up the curve with things like General Izalio. Set you speed depending on what you are seeing. This is the Praxis deck that I am actually excited about! Predatory Carnasaur beats up on Hooru Skys decks, Dawnwalker beats up on control decks, and Obliterate beats up on players with 6 or less health! Champion of Impulse does a lot more here since you are really greedy for power, so if it is a good card it will be in a deck that looks something like this. Possible Changes: You might want to consider going near mono-time. Drop the Drakes for more Dinosaurs maybe? You could also go much deeper on Burn. You could go even more midrange and include Steward of Prophecy. As someone who played a lot of Rilgon decks, I can tell you a lot of people are sleeping on this. Hooru aggro is not that bad of a deck for ladder, and some of its main bad match ups are now gone. You don’t even need to play Rilgon, which used to be the worst card in the deck! The Aerialist Trainer does a ton in this deck, by providing a blocker on the ground while powering up your air force, or just another body to power up with an Oathbook. You also get access to Silverwing Familiar, one of the biggest winners of the format. You will be surprised by how powerful this archetype is. Possible Changes: Hero of the people is kind of a cute inclusion, but it probably not good enough. You can go all the way to Rilgon if you like if you feel the format isn’t prepared, but he has not impressed me in the past. You know what? 2/4 for 3 with no additional text is really not that bad. In this deck Aerialist Trainer doesn’t need to be anything more than that. In this deck he gets to have some minor upside some of the time, but who really cares? Hooru Control gets to actually play Harsh Rule very happily, which is probably the only great spot for the card in the entire format. Eye of Winter also seems tight in a format with so few endurance units, as well as a lot of big Time idiots. Possible Changes: the mix of removal and finishers is hard to guess right now, but West Wind Herald + Herald’s Song + Channel the Tempest is a combo worth considering. I would encourage you to iterate on this aggressively at first. This deck is near mono-Justice, but with a splash of Shadow to meet the requirements of the format, and for a couple sweet tech cards. As I said above – Annihilate is a house, and if you can take advantage of that while making progress on board you should be in good shape. I have included 1 Mantle of Justice as a speculation, but I am not enthusiastic about the card. What I will say is that Crownwatch Cavalry and Auric Vigilante is a combo! Edit: an earlier version of this deck failed to meet the requirements to be classified as a true Shadow deck, since there were less than 10 Shadow cards. I have learned that all decks must meet this threshold to be legal in the event. This list increases the number of Shadow cards to meet this requirement. Possible Changes: This is a very heavy justice build, but you can go anywhere from this to full 2 faction. Impending Doom and Umbren Reaper are powerful cards. It is also possible to incorporate an Oathbreaker package. This will be one of the harder decks to get right given the relatively limited experience the community has with this style of deck, but I think it could be well positioned if someone is able to get it right. You get a lot of sweepers, and some very powerful midrange threats. I think the real question is whether you want Harsh Rule in the deck or not. Dark Return is extra powerful with Revenge, since it is totally amazing if you are returning a buffed unit with destiny. Possible Changes: It is very unclear right now where this deck wants to be positioned between Midrange and Control. Outside of 4 Annihilate I really have no idea what you want to be playing in terms of removal and sweepers. There is also not much here in terms of bonuses for Auric Vigilante. I know what you are thinking. This deck looks like garbage. It is just a mess of stuff that doesn’t do anything, but hear me out! As of this writing, we don’t quite know the details of the event, but we do know that it allows for deck switching. If that is the case, and it still follows a 7 wins versus 2 loses system, “Oops! All Spells” might have a place. There is a phenomenon that some refer to as the “winner’s metagame”, where the environment becomes somewhat stratified and the high ranking players lean toward a different kind of deck. For example, if we imagine that Xenan Killers is the “level 0” deck, then some of the strongest players will play something like Argenport Control to counter that. Now the “winner’s metagame” is saturated with Argenport, and no one is playing Killers. Although “Opps! All Spells” has an absolutely heinous match up against many aggressive deck, it will have an amazing match up against something like Argenport control. I admit there is a lot of wishful thinking going on here, but a well built Skycrag control list will be able to run over any traditional control deck. Removal does very little against you, while you have enough of your own interaction to neutralize an opponent’s limited threats until you grind them out with dragons. I for one will push myself to find something interesting here, since it seems like real challenge, and I really want Cradle to be good since it is so sweet. Of all the decks that I shared, this is the only one that I have not actually played. This is because it really relies on the preview card to actually win, and there is nothing I can play that even approaches a realistic substitute. BTW The name is a reference to a particularly degenerate deck from Magic the Gathering’s Legacy format that would be like an Eternal deck that played literally 0 power. You can find the decklist here, and watch a great video of the deck with Patrick Chapin on commentary here. Things get really fun at 19:30. Possible Changes: There is a lot of work needed here, but one possible combo is Herald’s Song + West Wind Herald + Channel the Tempest. It is also possible that Second Sight + Static Bolt might be worth adding, or maybe some Unstable Form + Magus of the Mist package? This deck has a number of very serious problems. The first problem is that it basically hopes to never draw Calderan Cradle. In a game where you play Cradle on turn 4 I think your expectation would still be slightly under 1 5/5 per game. In addition, this is hit really hard by the hate people will be playing to beat Praxis Tokens. Beyond even that, you are playing some 2/1s that will get totally ravaged by opposing token armies! I know, I am really selling this one, but I am very suspicious of any Skycrag aggro deck given what we know about the format. All that being said, things could shake out in a way where some of Skycrag Burn’s best match ups end up being popular. I have opted here for a near mono-Fire build, but something using Alpine Tracker might be a good anti-Tokens aggro list. Some people have been playing Skycrag aggro on ladder, and I would strongly suggest that you carefully re-evaluate these lists in the context of the format. Edit: an earlier version of this deck failed to meet the requirements to be classified as a true Primal deck, since there were less than 10 Primal cards. I have learned that all decks must meet this threshold to be legal in the event. This list increases the number of Primal cards to meet this requirement. Possible Changes: This is a near mono-fire build, but that is obviously not a necessity. More Alpine Trackers may be a good fit instead of some of the X/1s. Alternatively, you could even play Flash Fire to go further down the path of dedicated burn. ManuS has played Censari Brigand in similar lists in the past. Be fairly exact in what you want to beat. Of the two “level 0” strategies, this is one that I am actually afraid of. Bloodcall Invoker is just above Jotun Hurler in this deck, but the rest of the stuff that is going on is fairly powerful. That being said, Lethrai Falchion is a lot more dangerous than some people give it credit for. Aggressive decks can’t raise such big chunks of life gain, and against control it turns your Invokers into machines that produce a 7/7s each turn. If Steward of the Past decks become popular anything with Dawnwalker is going to get sat on, but this deck is certainly the early front-runner of the format. Possible Changes: I did not include the Friendly Wisp + Beastcaller’s Amulet package in the deck, but they are certainly worth testing. Might be worth even including Steward of the Past as tech in the mirror. This deck has a few changes from previous versions of Xenan Control. Obviously we include a little more life gain, as well as some extra late game. Something like Xenan Control is going to be close to the ceiling of the format in terms of power level. Mysic Ascendant does not fit well into many decks for the purposes of this format, but is right at home here. Steward of Prophecy is actually an interesting pick up, since it totally hoses Arcanum Monitor, which might may be popular this weekend. He is certainly a card that has gained a bit of value. I am also seriously considering Touch of the Umbren as a finisher. Although not exceptional in terms of cost, it will often close the door on more midrangy match ups. So there are my initial thoughts! I am very excited to try all this out. Lots of learning to be done, and opponents to smash. This just seems like a great experiment, and I hope some of my musings are useful for you as either a starting off point. I anticipate being totally wrong about some of my match up guesses, so don’t get to crazy trying to correct me on those, since they are all hypothesis. What are you planning to bring into the event? Any cards/archetypes you think I missed? What is the secret to breaking Skycrag? Let me know on Reddit or in the comments!